Ready, Aim,. . . Laugh? The mirror routine, which has been often imitated, has succeeded in producing an endless series of reflections. 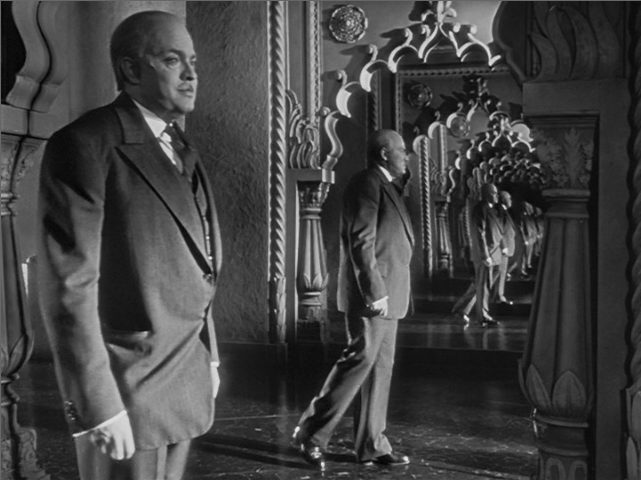 It is, in effect, an infinity mirror illusion. 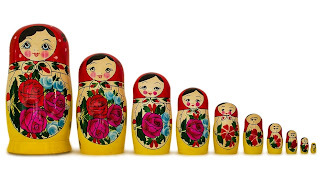 It could also be compared to a Russian nesting doll. 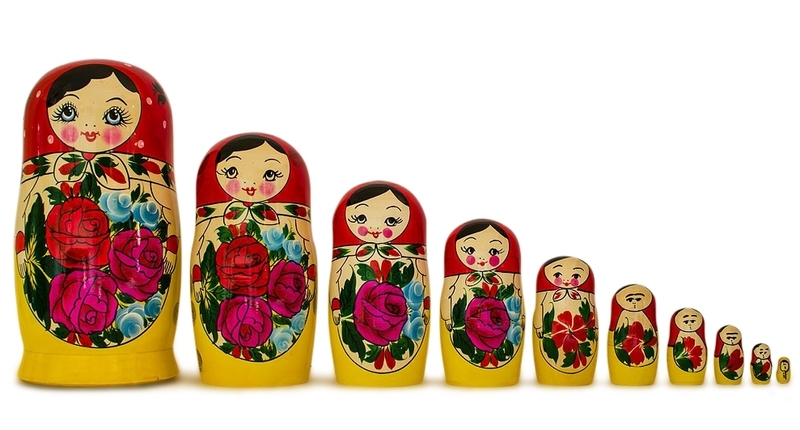 For every doll you open, you will inevitably discover another one inside. It is the reason that I have returned to this routine on a number of occasions. 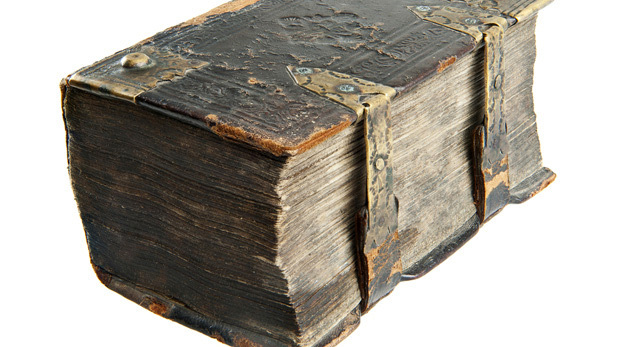 It is possible (though not certain) that the mirror routine originated in this battered old book. 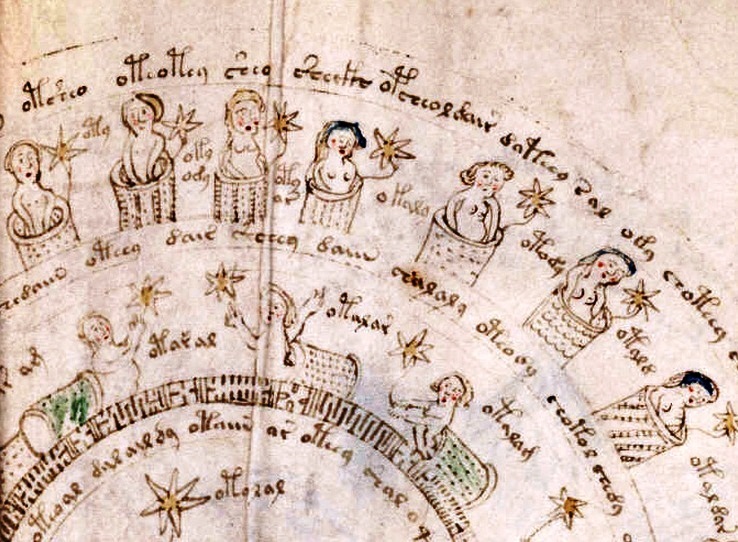 Oh, wait, that's the Voynich Manuscript. Of course, some may believe that a routine as legendary and everlasting as the mirror routine must have come out of a powerful ancient book of magic, but this is not book that I meant. 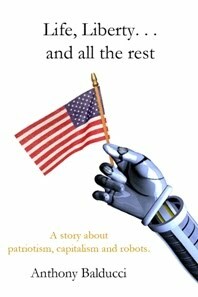 This is the book that I meant. It contains a three-act play called My Friend from India. We will get back to My Friend from India in a short while. In the meantime, let me take you to a tense scene that took place in a London courtroom on December 8, 1911, which was more than seventeen years after our brittle and yellowed book was published. 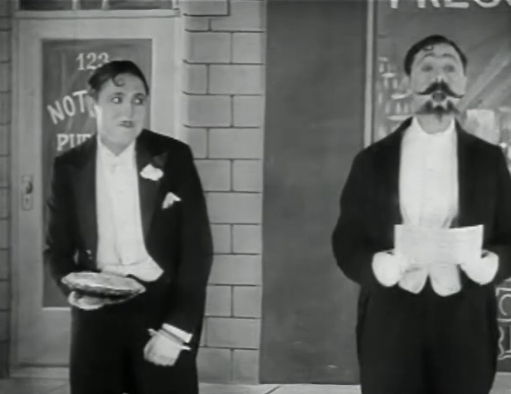 The plaintiff in the case was the Schwartz Brothers, a comedy duo that had established a strong following in Berlin with a 15-minute mirror act called "The Broken Mirror." The success of the "Broken Mirror" act had, only months earlier, inspired the brothers to embark on a tour of Europe. The brothers' routine was described in some detail by Variety critic Bayard. A struggle between a maid and a manservant leads to a dressing mirror being toppled and the glass being smashed to pieces. The servants must conceal the accident from their employer until a new mirror can be installed in the frame. Bayard wrote, "The master of the house, who is an actor, is suffering from the effects of a late night. When he goes to look at himself in the mirror he sees what he thinks is a reflection of himself, but which is actually his manservant. The movements of the two are identical, the only appreciable difference being that the manservant is by no means. . . [as] good-looking as his master. Finally the master tries to kiss the maid, and the manservant in his jealousy knocks the mirror over, leaving the impression that it has been newly broken." The disparity in the looks of the principals was an element of the act that was abandoned in time. People responded better if the characters looked the same, which is the reason that many versions of the act were staged with lookalike siblings if not outright twins. On film, the routine evolved in time to have the same actor play both parts through the use of split-screen. This actually diminished the routine as it was the virtuosity of two performers perfectly synchronizing their movements that made this business so thrilling and funny to a live audience. The Schwartz Brothers could not have been more upset when they arrived in London and discovered that they had been preceded into town by performers with an identical act. The "copy act," as they called it, was titled "Early Morning Reflections." 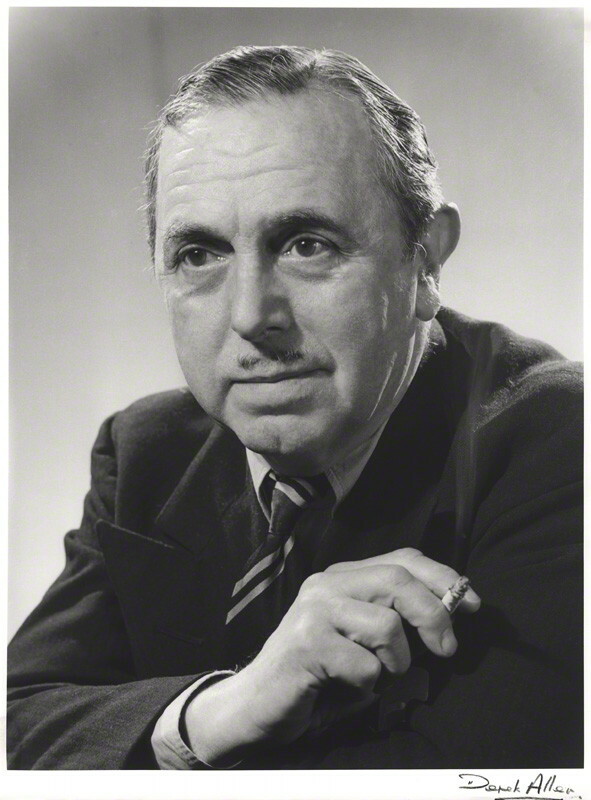 The lead comedian of the piece was Lauri Wylie, whose brother was pantomime impresario Julian Wylie. The Schwartz Brothers did not hesitate to express their objections to the press and, within days, they filed a lawsuit against the promoters of "Early Morning Reflections" for copyright infringement. At the time, Bayard gave the Schwartz Brothers' act a highly favorable review and dismissed "Early Morning Reflections" as an "inferior article." 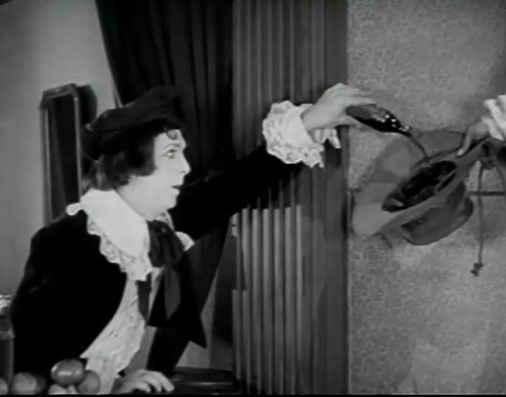 However, the critic made it clear that "The Broken Mirror" was not, as the Schwartz Brothers claimed, an original act. Bayard didn't see their situation as complicated. The Schwartz Brothers had great success "regenerat[ing] the old mirror business" and this prompted the "copyists" to create similar acts of their own. Sometimes the creative arts are not so creative. At the time that the Schwartz Brothers stirred up this controversy, there were at least four separate versions of the mirror act playing in major venues. There was the Schwartz Brothers' "Broken Mirror" act at the Hippodrome, "Early Morning Reflections" at the Palace, another version of "Broken Mirror" run by the Schwartz Brothers in Paris, and another version of "Early Morning Reflections" on the Orpheum Circuit in the United States. The Orpheum Circuit's version of the routine starred Sager Midgley and John Clark. Midgley, a well-respected veteran of the vaudeville stage, was not the sort of person who would knowingly steal an act that belonged to another performer. Here are publicity photos of the man. 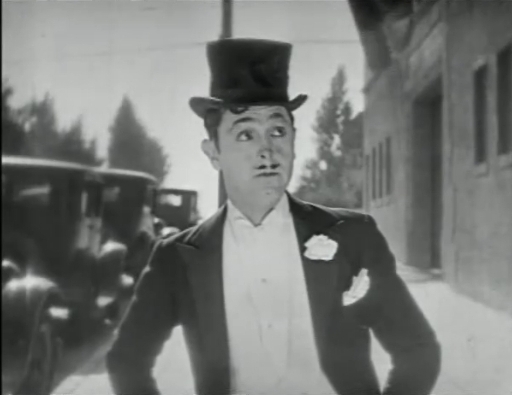 It happened to be around the time of the lawsuit that Max Linder, who had worked with the Schwartz Brothers in Berlin, came out with a film adaptation of the routine. It was bad timing for the film comedian to copy the act while the Schwartz Brothers were in such a litigious mood. The brothers warned Linder that they were prepared to file a lawsuit against him and this resulted in Linder's film studio, Pathé Frères, withdrawing the film from circulation. In court, the defense attorney put forth two lines of defense. First, he presented witnesses willing to swear that "Early Morning Reflections" was nothing at all like "The Broken Mirror." The witnesses included magician David Devant and actor Lionel Rignold. Devant was a proprietor of Maskelyne's Theatre of Mystery, which showcased magic tricks and illusions in amusing sketches. Devant testified that "Early Morning Reflections" was entirely different than "The Broken Mirror" in that the routine had a supernatural premise. He went into detail in describing the routine. A man looks into a mirror and sees his own disembodied spirit. The spirit reveals the man's future and shows him the woman that he will marry. When the man reaches to shake hands with the spirit, the spirit transforms into the Mephistopheles. This was a major dispute of the essential facts of the case. Devant's testimony was, in my estimation, dubious. The following year, Wylie would take his "Early Morning Reflections" act to New Zealand. At the time, a critic with the Wairarapa Daily Times would describe Wylie's act as follows: "Hans and Gretchen in quarreling manage to smash a large mirror. 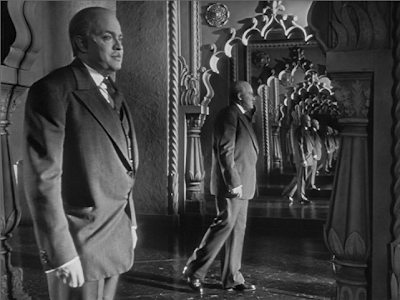 To hide the disaster, Hans determines to act the part of 'The Reflection' in the frame of the broken mirror." The critic made no mention of Mephistopheles. Devant's involvement in the case and the reason he was presented as a key witness was never explained in Variety's account of the trial. Was Devant simply an eyewitness of the act at the Palace Theatre or was the act in fact exhibited at Maskelyne's Theatre rather than the Palace Theatre as reported? If the act was shown at Maskelyne's Theatre, it would make sense for the act to incorporate supernatural elements. The second line of defense presented to the judge that day was more significant. The defense attorney presented evidence that, before the brothers introduced their act, similar mirror acts had been done before in several London productions. The Schwartz Brothers made no effort at all to deny this. They claimed that they were entitled to copyright protection because of the new excuse for the introduction of the broken mirror (the servant accidentally breaking the mirror). 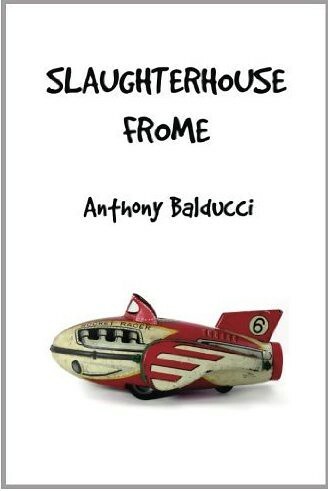 This brings us back to the book that was mentioned at the opening of the article. The mirror act was delineated in H. A. Du Souchet's My Friend from India, which was published in 1894. The play made its debut in France and it was followed soon after by an American version, which opened at Broadway's Bijou Theatre on October 6, 1896. In the play, a dressing mirror was broken when a maid took to dancing in front of the mirror and gave a spirited high kick that put her foot through the glass. So, it was not an original idea on the Schwartz Brothers' part to use a servant breaking the mirror as the premise for the act. But, in this case, the servant didn't pose as her master's reflection to hide her mistake. Through a series of misunderstandings and deceptions that can only be found in a farce, a man who is a guest at the home dresses in drag to conceal his identity and he is hiding behind the broken mirror when an elderly aunt enters the room. To keep from being discovered, he pretends to be the aunt's reflection. Makes perfect sense, right? Du Souchet wanted to leave no doubt in the viewer's mind that the aunt could mistake a man in drag as her own mirror reflection. So, he established that the woman was tipsy from a glass of wine and he also set it up that the woman had misplaced her eyeglasses. Blind and drunk, it is surprising that she didn't mistake a hat rack for her reflection. Also, the playwright made a point to explain the reason that the man and the aunt were wearing the same style of dress. The maid explained earlier in the play that the aunt and her niece happened to buy the same dress and the niece got so upset about this that she asked the maid to return her dress to the store. As it turned out, the maid let the guest borrow the dress. Routines tend to shed such set-up as time goes on. Entertainers assume that their audience knows the routine as well as they do. What was the point of explanations? At first, the aunt fails to catch on to the deception. It isn't until later, when she returns to get another view of herself in the mirror, that she is told by her brother that the mirror had been shattered earlier in the day. She reaches out and finds, very clearly, that the mirror frame is empty. She believes that the mirror must be haunted and feels as if she is about to faint. A guest rushes forth to revive her with smelling salts. In 1897, Justin Huntley McCarthy reworked the French farce for the London stage under the title My Friend the Prince. 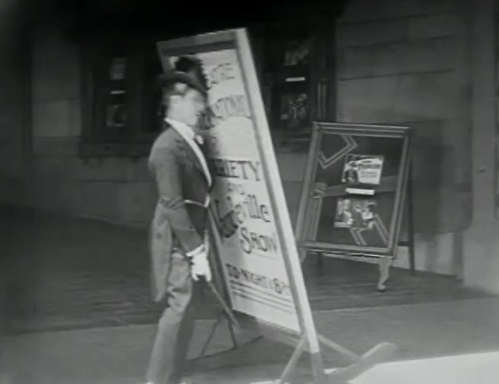 This meant that the mirror routine was already familiar to audiences in London, Paris and New York by the time that the Lyman Twins introduced the routine to the American vaudeville stage in 1900. It's no wonder that, in 1911, Variety referred to this as the "old mirror business." The judge expressed impatience with the arguments in the Schwartz Brothers' case, saying that he had seen neither of the sketches and had no time to do so. He dismissed the complaint, deciding that the premise of the mirror routine was by now public property. A writer with Variety pointed out that, even if the brothers had won the case and put an end to "Early Morning Reflections," the fact remained that other stage companies were well booked with similar acts and the brothers would have been required to start legal proceedings anew. It is interesting, though, that so many other mirror acts did in fact rely on the Schwartz Brothers' premise. The servant's desire to cover up the fact that he broke his master's dressing mirror was a reasonable set-up for the routine. Even more important, it made the servant an understandable and sympathetic protagonist even as he engaged in the silliness of pretending to be his master's reflection. Obviously, class tensions provided a strong undercurrent to this comic business. It could be thrilling to see a servant fool, and even mock, his master during such a daring confrontation. The brothers may have truly had a point about the importance of the way they set up the routine. 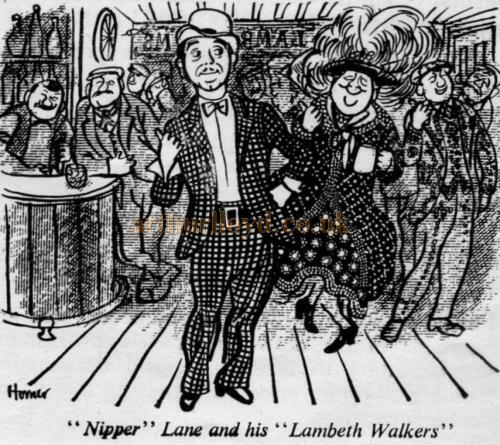 However, a 1906 edition of Variety included an item that shed an unflattering light on the duo. The item was a letter published in Variety's "Artists' Forum." Fair Haven, N. J., Sept. 13. In compliance with your request regarding the origination of the burlesque equilibristic work performed with the invisible wire, etc., I will try and explain same as nearly as possible. The idea came to me and I produced it during the two seasons that we were with the Lew Doekstader show in 1892-3-4. This will be vouched for by Mr. Lew Doekstader, and also Frank Dumont, who was with the show at the time and who now conducts Dumont's Minstrels in Philadelphia, Pa. The season of 1894-5 we visited Europe, opening at the Alhambra, London. Our time was extended to four months and our act at that time was copied, might say stolen bodily. We played two months at the Winter Garden, Berlin. At the close of our engagement there a German team (Schwartz Brothers) followed us doing the same business and our invisible wire work exactly. A positive fact that they themselves will not deny, for at the time they made a business of burlesquing any and all big and successful acts. The following year we returned to America and were engaged by the Weber & Fields show. At that time we shifted our hand, head balancing, etc., and substituted our burlesque aerial Japanese perch act, as at that time that line of work was not looked upon as a novelty. Shortly after, my old partner and I separated, he returning to Europe and I remained here and took on a partner, assuming the same firm name. We were booked then at Hammerstein's Olympia Theatre in New York. At the regular Monday morning rehearsal William Hammerstein approached me saying that he had just returned from Europe and he saw an act there doing our wire work, jesting me as to how good he thought the act was. When I asked him if he didn't give any credit to the originators, a warm debate followed. I have never played Hammerstein's since. Now I understand there are several teams using the wire and doing a facsimile of my work and tricks in same. I find that it has hurt me a great deal in securing engagements. Still there is no way to prevent it. I don't remember ever doing a wrong to any brother artist during my twenty years in the vaudeville branch of the show business. So, if this letter is to be believed, the Schwartz Brothers lacked credibility. They loudly complained of piracy when they, themselves, were pirates. It is possible that the name of their act, itself, was a lie. It was reported by one source that this "brother" duo was actually a father and son. New versions of the mirror act continued to crop up. Only two months after the Schwartz Brothers' lawsuit was dismissed, the legendary Hanlon Brothers added the mirror act to their "Just Phor-Phun" show. This version of the routine centered on a ham actor getting dressed in his hotel room and a member of the hotel staff pretending to be the man's reflection. 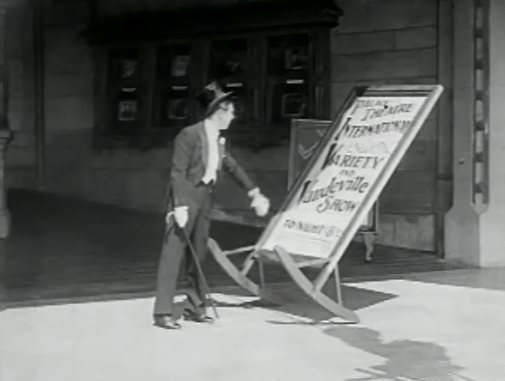 Variety editor Sime Silverman was enthusiastic in his praise of the act. He anticipated the Schwartz Brothers having "fits" about the new act, but he saw no justification for this reaction since it was clearly established that a number of others had performed the routine before the brothers had. In June of 1913, Doris Wilson and Co. (singer Doris Wilson and her sisters Dot and Alma) introduced a mirror act called "Through the Looking Glass." 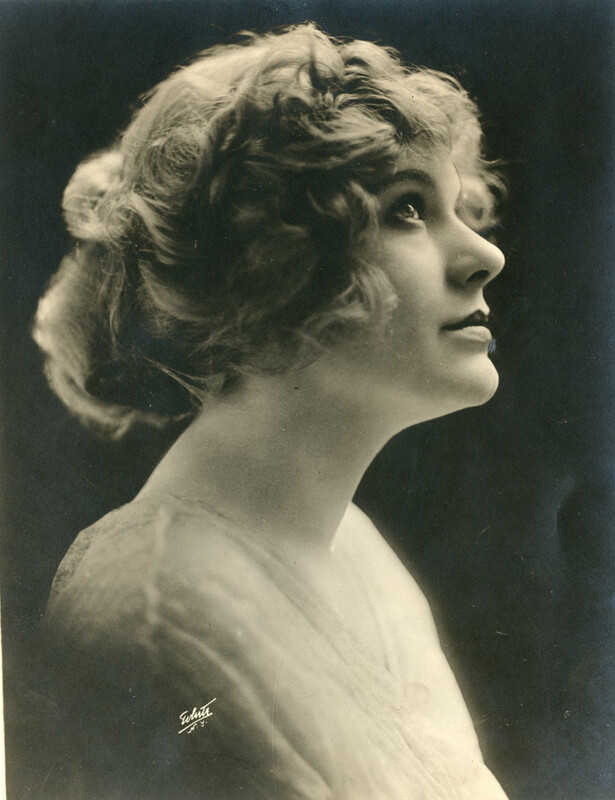 Doris was a veteran star of musical comedy who, according to one critic, could "sing top notes." Dot and Alma were described by the San Francisco Call as a "small but extraordinarily active chorus." Dot received big applause of her own for her dancing prowess. Silverman acknowledged that the mirror act had been done many times before, but he insisted that the Wilson girls did it "differently and much better." One big difference was that the girls had turned the routine into a musical number. 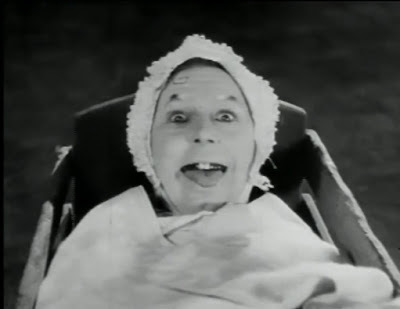 Doris actually burst out in song midway through the scene. Doris played a wealthy woman and her sisters played her maids. She started out the routine with one sister and eventually the third sister became mixed up in the action. 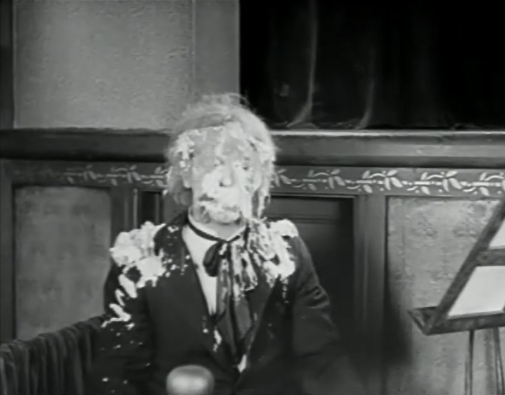 This is essentially what happens in the Duck Soup routine when Chico joins Groucho and Harpo at the end of the routine. According to Silverman, the pretty sisters generally looked alike except that one was shorter than the others, but it hardly mattered as the sisters were able to look sufficiently similar by wearing identical gowns and hairstyles. Wilson and her sisters, also known as The Doris Wilson Trio, carried on with this routine for at least the next nine years. The mirror routine with singing and dancing, how did that work exactly? This would have worked, too. Edison produced a three-reel film adaptation of My Friend from India in 1914. 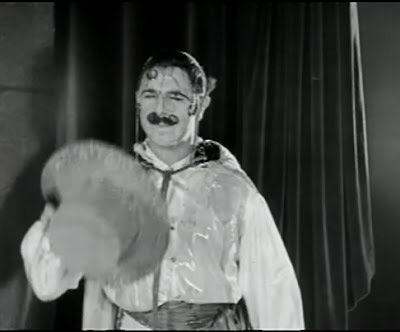 Walter Perkins, who had originated the title role on Broadway, recreated the role for the film. A Motography critic who reviewed the film referred to "several stunts which have been performed before." He pointed specifically to the mirror routine. He wrote, "[B]ecause of their difficulties and the opportunities for introducing new wrinkles in them, [these stunts] never fail to amuse if accomplished correctly and smoothly." It is true that the routine offers "opportunities for introducing new wrinkles," which is the reason that the routine has lasted as long as it has. The Schwartz Brothers continued successfully with the mirror routine for years. Audiences never seemed to tire of the act, responding every time as if it was entirely new to them. Of course, it was also possible that many people in the audience were not familiar with the routine. After all, this was before television was around to broadcast the same entertainment content to millions of people at the same time. 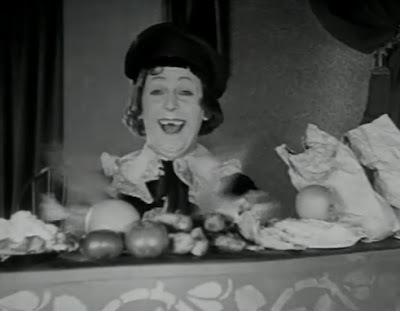 As a New York Clipper critic observed, the duo had come to expect the act to achieve "the usual laugh effect." Another critic who observed the brothers perform the act was impressed that "[e]very point registered with a wallop." The Schwartz Brothers' journey with this act likely ended in 1921. A version of the mirror routine very much like the Schwartz Brothers' version appeared in Max Linder's Seven Years Bad Luck, which was released on February 6, 1921. 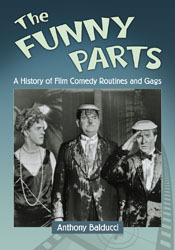 The Schwartz Brothers promptly sued film producers Robertson-Cole and First National for unauthorized use of their act. The brothers perhaps thought that the American courts would be more sympathetic to their cause, but nothing was found in my research to suggest that this case ever made it to court. Fred Schwartz was the only member of the act to receive billing when the act was presented at San Francisco's Hippodrome Theater on July 6, 1921. Did his partner retire or pass away by this point? 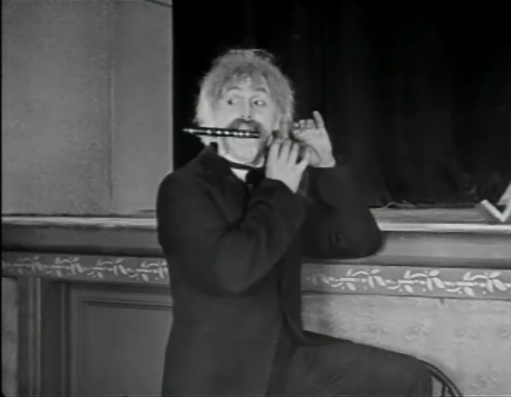 I was unable to find a photo of the Schwartz Brothers, but I did find a film clip of Fred. He plays the tailor in this scene from Alfred Hitchcock's Sabotage (1936). The routine made its return to Broadway in 1921. 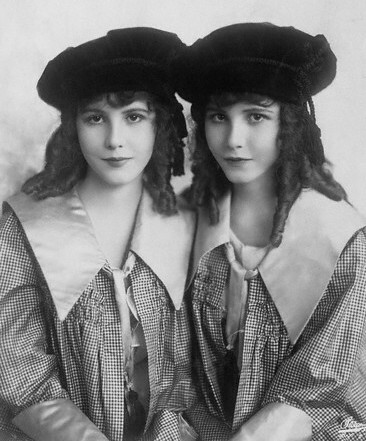 The routine was now performed by the lovely Fairbanks twins, Madeline and Marion, in a musical comedy called Two Little Girls in Blue. I don't know if these young ladies were funny, but I'm sure that they furnished a version of the routine that was aesthetically pleasing. 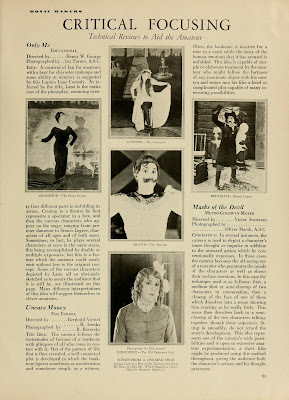 The last review that I found for "The Broken Mirror" was published on December 9, 1921, in response to a performance at the Shubert's Crescent Theatre in Brooklyn, New York. 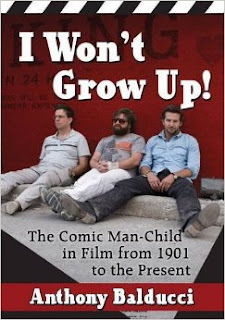 A Variety critic wrote, "Schwartz Brothers struck a soft spot. . . with their standard comedy turn 'The Broken Mirror.' The act wears well, the laughs coming with just as much frequency Tuesday night as they did when the 'Mirror' skit was first seen around quite a few years back." 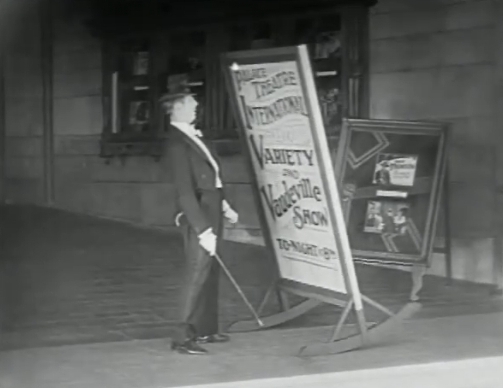 In 1923, the mirror routine was included in the lavish George White's Scandals musical revue. 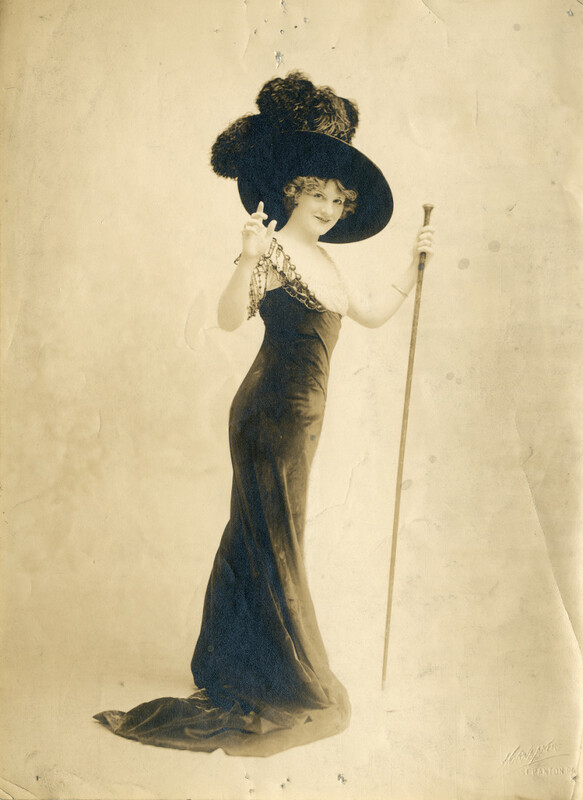 The Variety critic wrote, "The 'Mirror' number is well fitted in green and pearls and large picture hats." Hollywood took full possession of the routine after this. 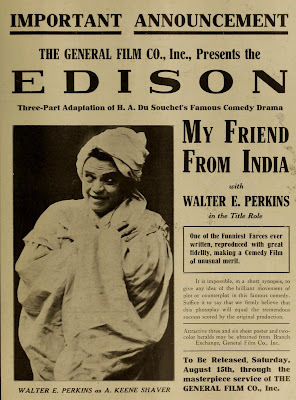 DeMille Pictures Corporation released a remake of My Friend from India in 1927. Here is the mirror routine from that film. The scene is pretty much as it was described in the play. The main difference is that, in the play, the woman talked to herself endlessly in the scene. She expressed her pleasure seeing how slim she looked in the mirror. She complained aloud that her hat was sitting on her head incorrectly before she fussed to adjust the hat pins. For sure, the pantomime with the hat pins got more laughs than any of the dialogue. Even Groucho knew to stow the wisecracks when he performed the routine. Interestingly, hats remained key props in many variations of this routine. So, that's our story for today. I hope that you liked it. For now, I will study the Voynich Manuscript to see if I can find evidence of a 15th Century version of the mirror routine. I will end this article with a version of the mirror routine performed by Norman Wisdom in the 1958 military comedy The Square Peg. 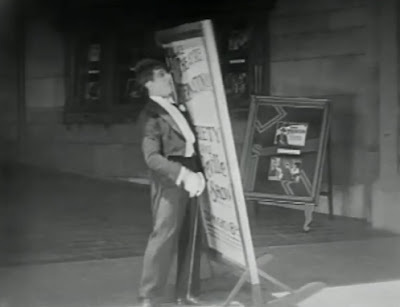 Correction (published September 12, 2014): It was discovered through further research that Fred Schwartz did not end his performance of the "Broken Mirror" act in 1921. In fact, he presented the act in a ten-week engagement at London Hippodrome in 1926 (The Vaudeville News, December 20, 1926). 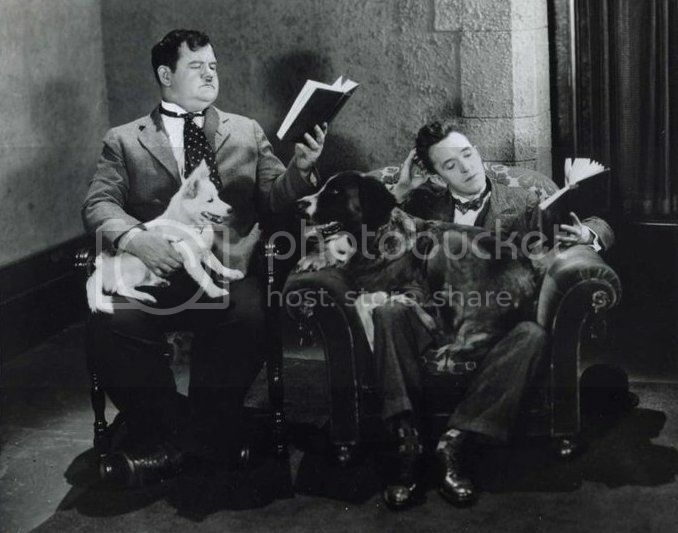 The Short-lived Double Act of Buster Keaton and Lloyd Hamilton is Finally Revealed! 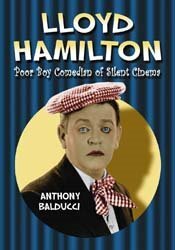 A question that was in my mind when I wrote my biography of Lloyd Hamilton was whether or not Hamilton ever socialized with Buster Keaton. Both men had a mutual drinking buddy, Lew Cody, who figured prominently into their social activities. It seemed that the men were bound to cross paths at times. I have at long last discovered an occasion in which Cody did in fact bring Hamilton and Keaton together and, even more significant, he got the two master comedians to perform a burlesque act together. In 1926, Cody was asked to host the grand opening of the Loew's State Theater in New Orleans. He brought along funny pals Hamilton and Keaton to add levity to the event. 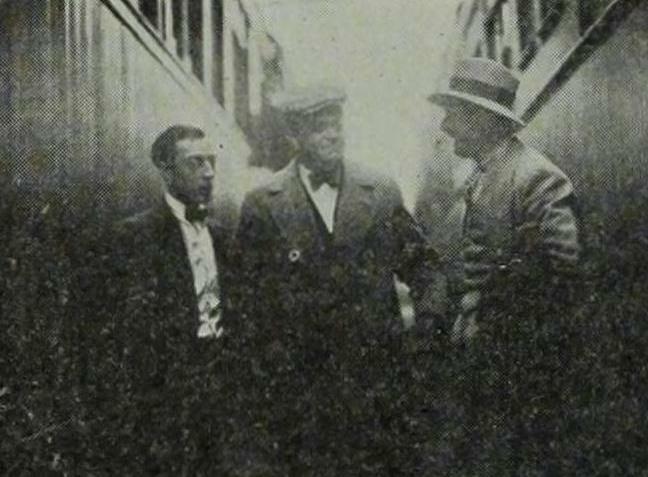 The actors rode together by train to New Orleans. Not surprising considering the festive ways of these men, the journey turned into a longstanding party on wheels. At the theater's opening, Cody let the crowd know that big movie stars were in attendance. He introduced Gloria Swanson, which was the cue for Hamilton to walk out on stage in drag. Next, he introduced Douglas Fairbanks. 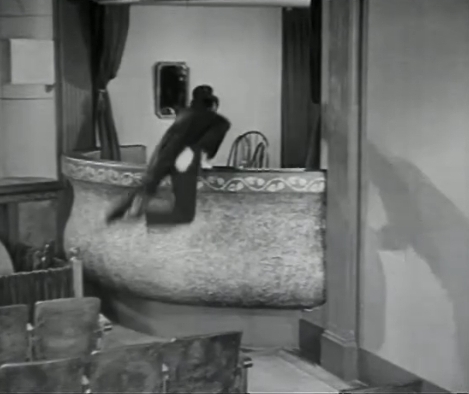 Keaton appeared at this point to perform a series of comic acrobatics. 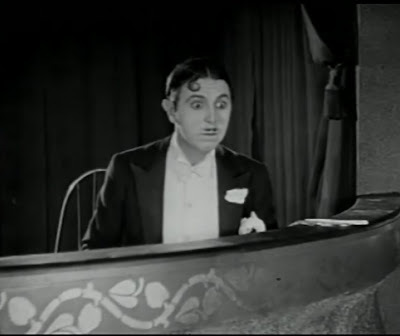 Later, while making a speech, Marcus Loew was interrupted by Hamilton and Keaton, who stormed into the gathering to sell peanuts and sheet music. Loew's publicist, Nils Granlund, playfully ordered the men to sit down. Hamilton complied by laying down on the floor and listening attentively as Loew finished his speech. 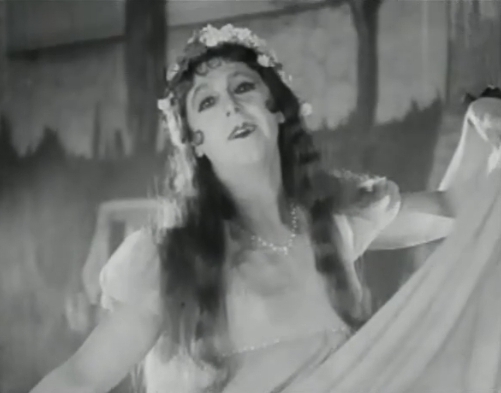 Dorothy Mason, a Ziegfeld Follies girl, noted in a report to Exhibitors Daily Review that Keaton entertained the party on the train ride home by playing the ukulele. Hamilton, she said, was "very bashful," which is something that was commonly noted by people who had observed Hamilton in social situations. 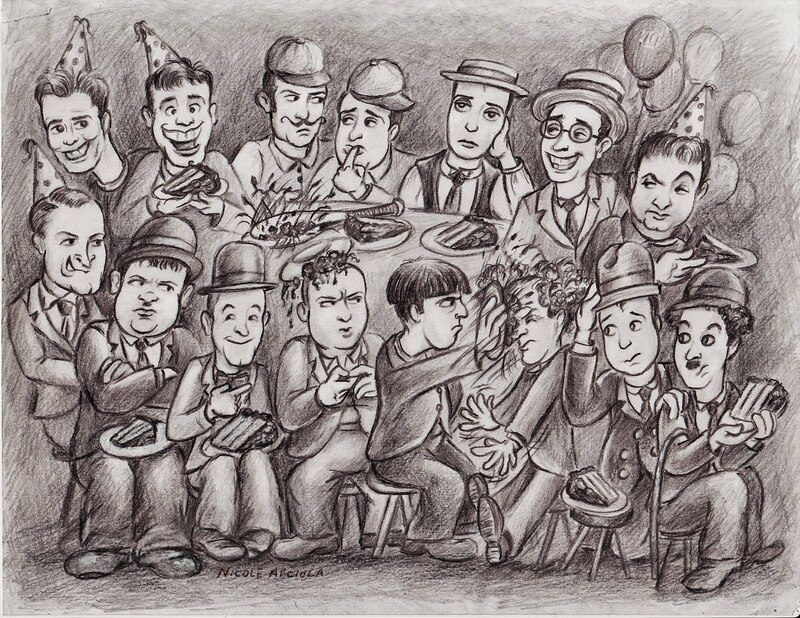 It's a shame that the comedy stars of the silent era weren't free agents who could team up for the occasional buddy comedy. 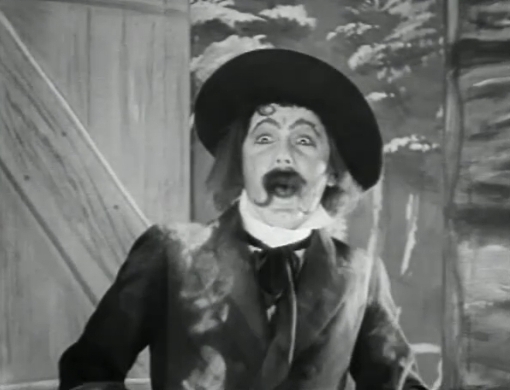 It would have been great if Keaton and Hamilton could have clowned together in the same film. 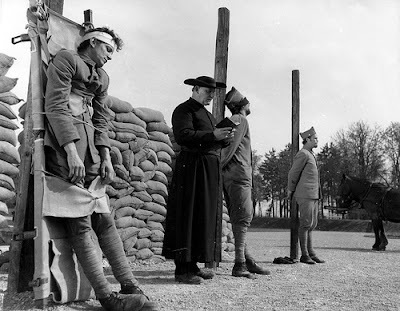 A death by firing squad is a barbaric act dressed up with good manners and fine ceremony. 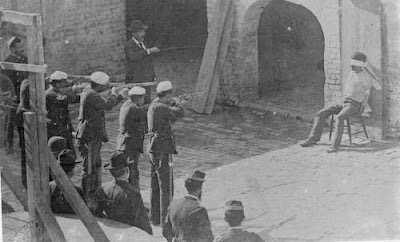 It is fake civility to gently ask a man if he wants to wear a blindfold while a line of rifles is being aimed in his direction. And what is the point of having a drummer perform a drum roll? 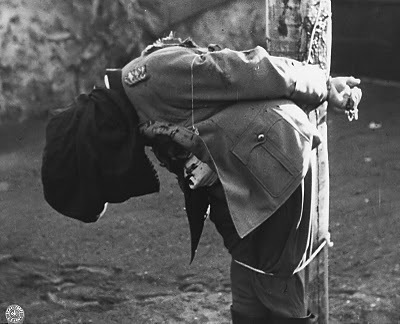 The incongruity of these elements has long made the firing squad a source of both comedy and drama. Movies allow us to emotionally process the unpleasantries of the world. We can laugh about these things or we can cry. 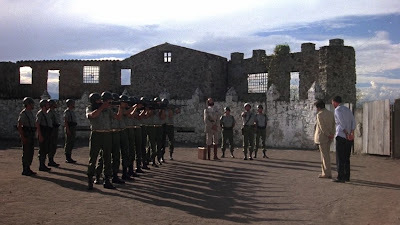 But it would be difficult for me to laugh at a funny firing squad scene immediately after seeing a tragic firing squad scene. For me, this stretches irreverence too far. This is the complete scene from Hands Up. 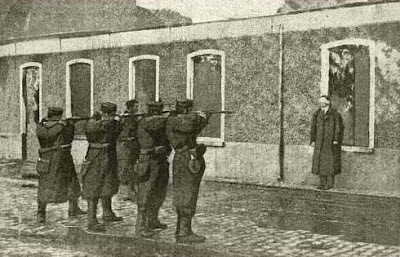 Of course, nothing is more grim than a firing squad in real life. Test yourself. See how you feel after alternately watching comic and dramatic takes on the firing squad scene. 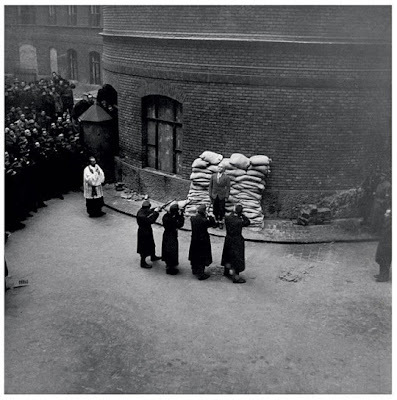 We are so accustomed to the lengthy firing squad ceremony that this abrupt execution is shocking. John Huston managed to include a touch of black humor in this firing squad scene from The Treasure of the Sierra Madre (1948). 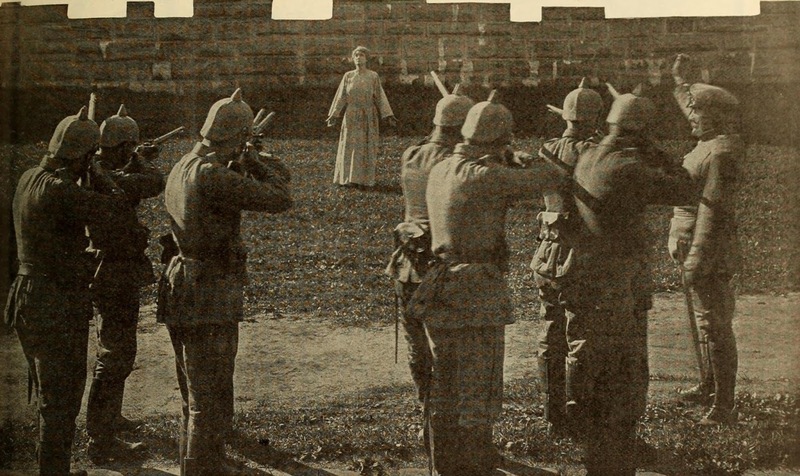 Hollywood has provided firing squad parodies since its early days. This scene from the Keystone comedy Cohen Saves the Flag (1913) is the earliest example that I could find. It is not surprising that Keystone, which specialized in mock melodramas, would turn to this type of material. At the time, film melodramas that featured firing squad scenes were released to theaters on a weekly basis. Unfortunately, Cohen Saves the Flag offers little more than Ford Sterling mugging for the camera. 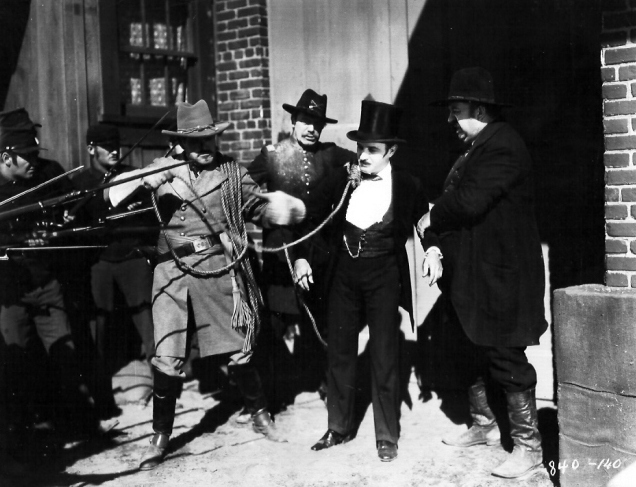 A more clever scene, which was devised by Marshall Neilan, appeared in The Deadly Battle at Hicksville (1914). 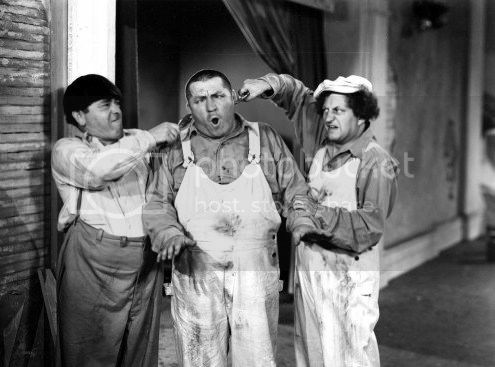 Rotund John E. Brennan refuses to stand in place for a firing squad and manages to miraculously dodge bullets. Two soldiers hold him still as the next volley of bullets is fired, but the soldiers are shot and Brennan remains unscathed. 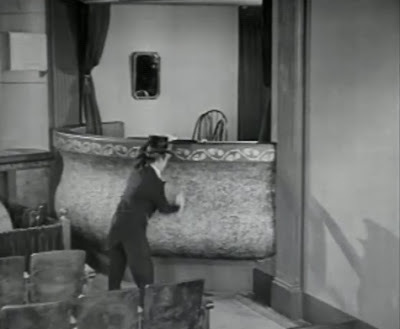 An attempt is made to execute Brennan by firing a cannon at him, but Brennan catches the cannon ball in his bare hands. Other comedy films that included firing squad scenes are The Battle of Ambrose and Walrus (1915), Mr. Jack Ducks the Alimony (1916), In the Ranks (1916), The Crackerjack (1925), The Kid from Spain (1932), Uncivil War Birds (1946), and A Southern Yankee (1948). Woody Allen presented firing squad scenes in three films - Casino Royale (1967), Bananas (1971) and Love and Death (1975). 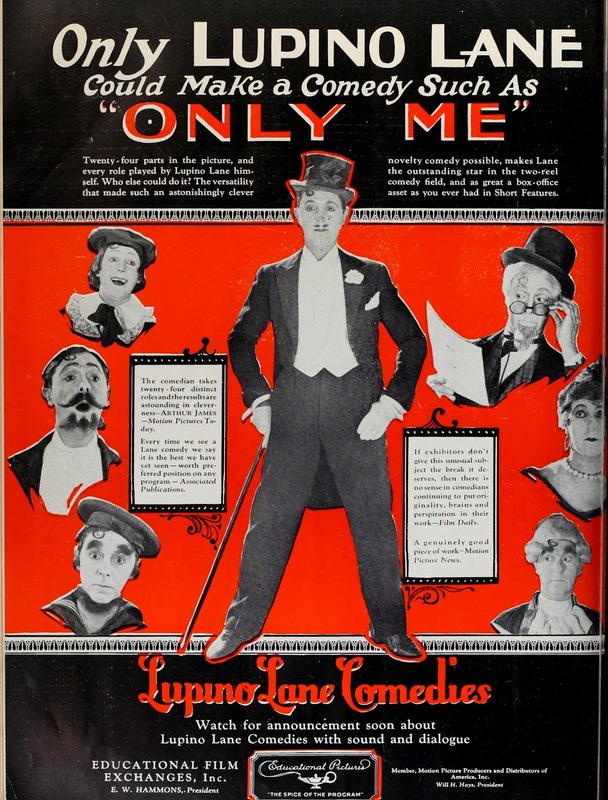 Lupino Lane received more than the usual amount of publicity for Only Me (1929), which featured the lively comedian going it alone in 24 distinctly different roles. 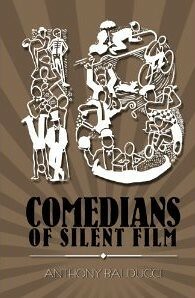 I wrote about this film extensively in The Funny Parts and Eighteen Comedians of Silent Films. I put together a collection of screencaps to aide me in writing a complete and accurate analysis of the fast-moving film. I thought that it might be interesting to post the screencaps. The plot centers on an inebriated man who visits a theater and finds that everyone in the theater looks like him. 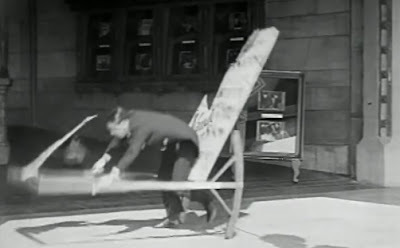 He should know that his visit to the theater will not go well as, even before he enters the building, he is attacked by a theater sign. Lane has been criticized by many for his excessive use of wire effects. 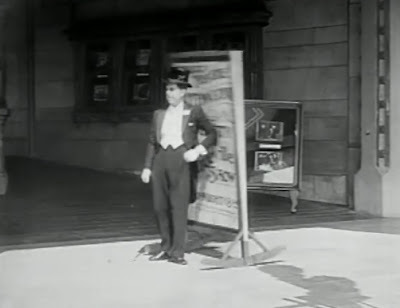 This is an instance where the comedian pointlessly uses a wire effect to insert himself into a theater box. Lane accidentally yanks off a ballerina's artificial leg and thinks it would be a good idea to strum it like a banjo. 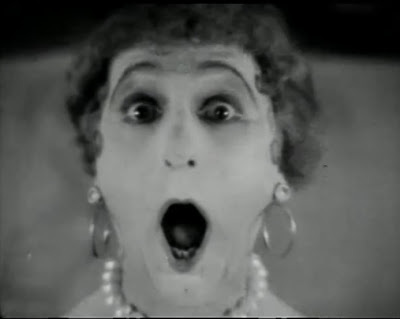 Lane plays a sailor, villainous landlord, a baby and a mother in a melodrama sketch. 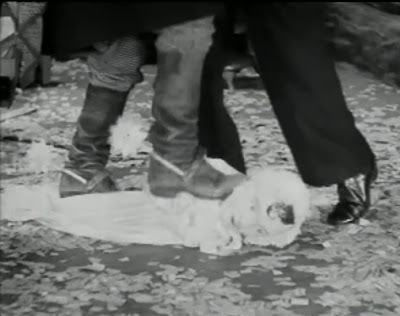 The baby gets tossed around roughly and, when the sailor and landlord fight, the baby gets trampled under foot. This is just the sort of baby doll abuse that I wrote about in a recent post. 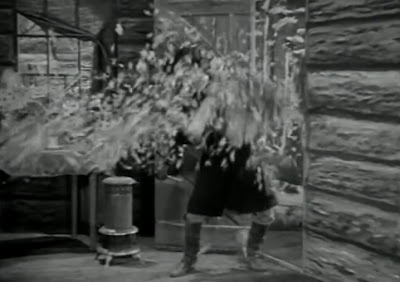 The rest of the film takes its cues from the Fred Karno Company's famous "Mumming Birds" sketch. A bratty boy in a theater box assaults the entertainers with food and beverage. The inebriated man is appalled by much of what he sees. Eventually, he initiates a pie fight with the various members of the cast. The film is a noble effort, but it is hampered by low-budget special effects. 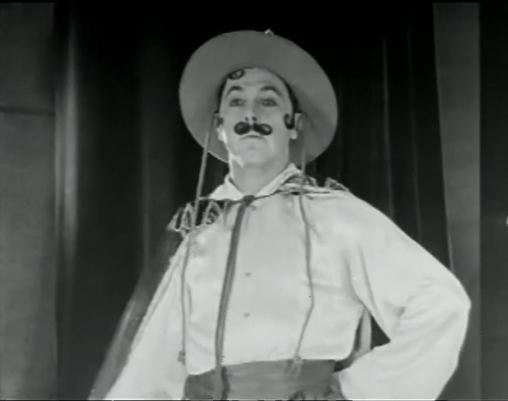 It lacks the technical virtuosity that Buster Keaton brought to The Playhouse (1921), a film that no doubt influenced Only Me. I am a big admirer of Lupino Lane. He was an entertainer who managed to successfully redefine himself during the many stages of his long career. 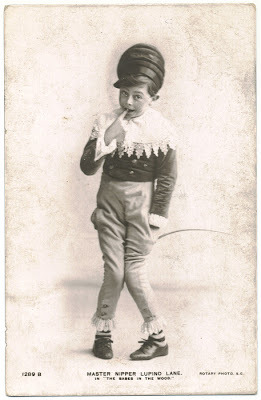 Here is a publicity portrait of a very young Lane that was made to publicize the pantomime "Babes In The Wood," which was staged at London's Lewisham Hippodrome. This is one of the last portraits taken of Lane before his death in 1959. Lane accomplished a great deal in his six decades as an entertainer. He abandoned Hollywood for the London theater, where he had immense success as a musical comedy star. Few comedians have enjoyed enduring popularity to the extent that Lane had.